Kapil Seshasayee has revealed the video for his new single 'The Agitprop', the third to be cut from his debut album A Sacred Bore and released via Liverpool's Loner Noise label. The musician's work explores the lasting effects of the Indian Caste System, and the ongoing tensions it creates both in India and abroad. Last year, he took part in an excellent in-depth interview with tQ's Veronica Irwin about his explorations. You can watch the video for 'The Agitprop' above, which ties in with his visual installation piece that was unveiled at Wrong Festival in Liverpool in April. 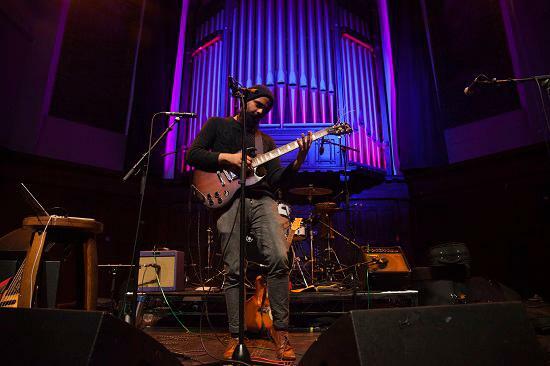 You can read a review of that festival, including Seshasayee's superb live set, here. Seshasayee has also explained the concepts behind the new single in detail. He said: "The Agitprop (named for a t shirt referencing Hindu scripture that was distributed by associations which were pivotal in coordination of the deadly Charlottesville rally in 2017) is the third and final single from debut LP A Sacred Bore. Despite a rhetoric steeped in white supremacy, the alt-right have appropriated major elements of Hindu philosophy reminiscent of modern Hindu nationalism (also known as Hindutva) as a means by which to galvanise their cause with a wanton spirituality. "Prominent right-wing publishing houses such as Arktos (based in India for its first few years of operation) have aided in the distribution of these ideologies. Authors published by Arktos include Italian philosopher Julius Evola – who wrote in praise of Hinduism’s upkeep of the caste system as a parallel to his own pro-aryan beliefs. "The video for the single marks my 4th collaboration with The Production Atticand is a culmination of my typographic artwork and visual installation unveiled at Liverpool’s Wrong Festival in April of this year. With this single, I hope to illuminate these parallels between the alt right and parties striving for upkeep of the caste system."